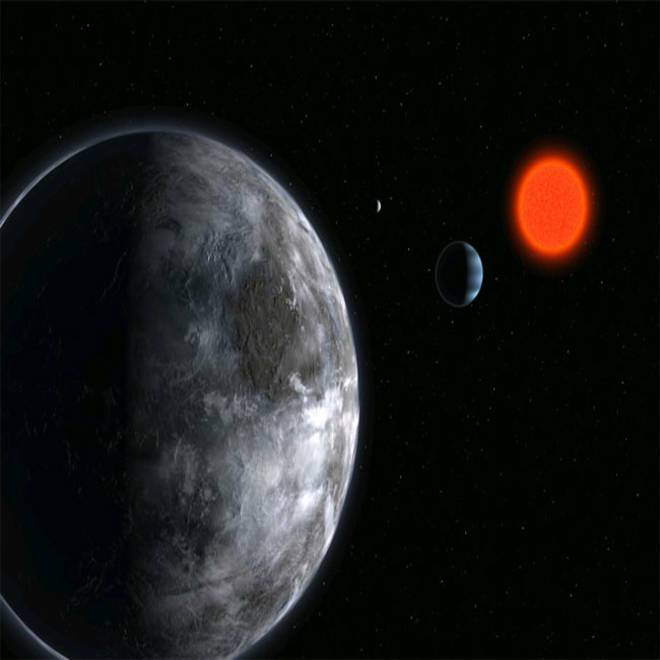 An artist's impression shows a planetary system around a red dwarf star. An analysis of data from NASA's Kepler planet-hunting mission suggests that about 6 percent of all red dwarf stars should have habitable, Earth-sized planets — and because red dwarfs are the most common stars in our galaxy, the nearest Earthlike planet could be as close as 13 light-years. "We thought we would have to search vast distances to find an Earthlike planet. Now we realize another Earth is probably in our own backyard, waiting to be spotted," Harvard astronomer Courtney Dressing, the lead author of the data-crunching study, said in a news release. That doesn't mean we can just hop out the back door and head for a red dwarf: Although 13 light-years is relatively close in astronomical terms, it would still take more than 50,000 years to cover that distance using current propulsion technology. But the finding could lead astronomers to cast a wider net in the search for the conditions conducive to extraterrestrial life. Dressing presented her team's findings on Tuesday during a news briefing at the Harvard-Smithsonian Center for Astrophysics, or CfA. The research paper is expected to be published in The Astrophysical Journal. Red dwarfs are thought to account for about 75 percent of the stars in the Milky Way: They're smaller, cooler and fainter than our sun — so faint, in fact, that no red dwarf is visible to the naked eye. But the fact that they're cooler means that closer-in planets are more likely to be habitable. That's good news for planet-hunters: The Kepler space telescope, which was launched in 2009, detects alien worlds by looking for the subtle dimming of starlight as a planet passes in front of its alien sun. Closer-in planets would cover more of the star's disk, making them easier to detect. Dressing and her colleagues sifted through the 158,000 stars targeted by the Kepler probe to identify all the red dwarfs. She said the stars' sizes and temperatures were calculated using computer models "that are more appropriate for these small red stars." Previously, those stellar characteristics were derived using a less precise, one-size-fits-all type of computer model, she said. The fresh analysis showed that almost all of the stars were smaller and cooler than previously thought. That means the worlds detected around those planets would be proportionately smaller as well, bringing more of them into the Earth-sized category. The astronomers identified 95 Kepler candidate planets that are circling red dwarfs. When they ran those candidates through their fine-tuned computer model, they found that three of them were roughly Earth-sized, with the right temperature to sustain liquid water and life. And when they factored in their estimates for the proportion of planets that would have gone undetected, due to the limitations of the Kepler mission's observing method, they concluded that 6 percent of all red dwarfs should have an Earth-sized, habitable planet. "That rate implies that it will be significantly easier to search for life beyond the solar system than we previously thought," the CfA's David Charbonneau, a co-author of the study, said in Wednesday's news release. Because our sun is surrounded by a swarm of red dwarfs, the statistics suggest that the most probable distance for such a habitable planet would be 13 light-years, if all the surrounding stars could be examined with a suitable telescope. Kepler isn't designed for such a survey — but a new type of space telescope, or a big enough network of ground-based telescopes, could take on the job. For example, NASA's James Webb Space Telescope, currently due for launch in 2018, could study the thermal characteristics and perhaps even the atmospheres of nearby red-dwarf planets, Charbonneau said. The researchers said that a habitable planet circling a red dwarf would be markedly different from Earth: It would probably be locked into an orbit that kept one side of the planet perpetually facing its alien sun. Charbonneau said the heat could conceivably be transported around the globe via a thick atmosphere or ocean. Also, red dwarfs are known to be quite variable in their emissions, with occasional strong flares of ultraviolet light. "If that were to happen on Earth, it would cause havoc," Charbonneau told journalists. But Dressing said alien life could conceivably adapt to such stresses. "You don't need an Earth clone to have life," she said. Red-dwarf planets might have at least one edge over Earth in the habitability department: Astrobiologists have estimated that our planet could be rendered inhospitable to life in the next couple of billion years, due to a long-term increase in solar radiation. Red dwarfs are different in that regard. "They are incredibly long-lived," Charbonneau told journalists. "They never show their age." He said it's conceivable that some of the planets circling red dwarfs could remain habitable for 10 billion years or more. Caltech astronomer John Johnson said the newly reported research marks one more step toward taking the search for alien Earths out of the realm of science fiction and putting it squarely in the realm of science fact. "Now I think the conversation is starting in earnest," he said. The three habitable-zone planetary candidates identified in this study are Kepler Object of Interest (KOI) 1422.02, which is 90 percent the size of Earth in a 20-day orbit; KOI 2626.01, 1.4 times the size of Earth in a 38-day orbit; and KOI 854.01, 1.7 times the size of Earth in a 56-day orbit. All three are located about 300 to 600 light-years away and orbit stars with temperatures between 5,700 and 5,900 degrees Fahrenheit (3,150 to 3,260 degrees Celsius). For comparison, our sun’s surface is 10,000 degrees F, or 5,500 degrees C.
First published 11 a.m. ET Feb. 6. Last updated 12:53 p.m. ET Feb. 6.